Leopold I (F930) is a Karel Doorman-class frigate of the Naval Component of the Belgian Armed Forces. Prior to 29 March 2007, the ship was known as HNLMS Karel Doorman (F827). It is one of the two frigates of this class that was purchased from the Royal Netherlands Navy on 22 December 2005. HNLMS Karel Doorman was the first ship of the Karel Doorman class of multi-purpose frigates (also known as "M-fregat" class). She was the third ship in the Royal Netherlands Navy to be named after Admiral Karel Doorman, who was killed during the Battle of the Java Sea. The ship was laid down on 26 February 1985, launched on 20 April 1988 and commissioned on 31 May 1991. She took part in anti-drug operations in the Caribbean together with the US Navy, was part of the UN operations in the Adriatic Sea during the conflicts in the former republics of Yugoslavia, as well as various NATO exercises. On 20 July 2005, the Belgian government decided to buy two of the remaining six Dutch M-class frigates to replace the two remaining frigates of the Wielingen class (Wielingen and Westdiep) currently in service with the Belgian Naval Component. On 22 December 2005, Karel Doorman and Willem van der Zaan were sold to Belgium. Karel Doorman was taken out of service in 2006 and turned over to the Belgian Naval Component on 29 March 2007 where the ship was christened Leopold I, in honour of the first King of the Belgians, by Queen Fabiola of Belgium at Zeebrugge Naval Base. The patronage of Leopold I was accepted by the city of Nivelles. 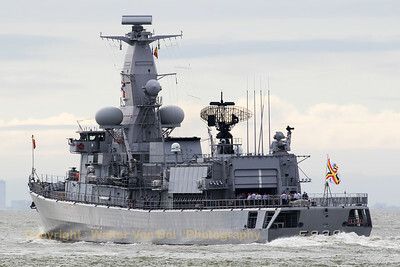 Willem van der Zaan was commissioned into the Belgian Naval Component as Louise-Marie in April 2008.